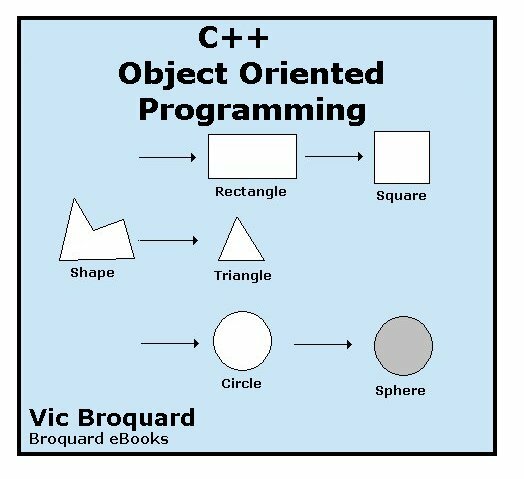 If you don’t know OOP, C++ Object Oriented Programming is the book for you! Easy to read and yet comprehensive, you can teach yourself OOP with this book, because this book is an entry level course in Object Oriented Programming in C++. C++ Object Oriented Programming assumes only that you know the basics of C/C++ and covers class construction, overloaded functions, inheritance and more. See for yourself what you can learn to do! With this book, you will learn to write all of the samples in the data structures link. Note: to write programs like those in the games and windows samples, you will need to learn much beyond just OOP, so check my Blog article on which path is right for you. The first three chapters of C++ Object Oriented Programming present the iostreams, structures, reference variables, pointers and the use of dynamic memory allocations. These chapters serve as a complete review for those already familiar with C++ basics; however, for those only familiar with C programming, these chapters cover all of the basic extensions of the C++ language. Thus, by the start of chapter 4, all readers should be ready for the OOP portion of the language. Go ahead and read the table of contents to see what’s covered. The construction of C++ classes are covered in the next two chapters. The approach begins with very simple classes and gradually become more complex as more and more features are added in a gradient manner. After the constructors, destructors and access functions are presented, operator overloaded functions are discussed in the next two chapters. C++ Object Oriented Programming presents the basic operator functions first and in the next chapter, the copy constructor and assignment operator are illustrated along with the usage of dynamic memory allocated member data. Inheritance is similarly split into three chapters. The first chapter shows basic features and problems of inheritance while the second chapter expands into more complex situations that require virtual functions and abstract base classes. The third inheritance chapter is devoted to practical programming examples of inheritance. The next chapter of C++ Object Oriented Programming covers the handling of error situations, followed by a presentation of templates. In the real world, most company data bases are in binary format or in a database, not text files. So the next chapter of C++ Object Oriented Programming covers the principles of binary files. The final chapter of C++ Object Oriented Programming shows an easy technique for class instances to be written in binary format to a file to achieve “persistence” of an object. The object must, of course, be able to also “read itself” back into a memory instance. C++ Object Oriented Programming has many complete programming examples. All of these sample programs accompany the book. Each chapter ends with a set of Review Questions and Stop Exercises as well as the expected Programming Problems. The Stop Exercises illustrate many of the common errors beginning OOP programmers make. Thus, if you spend the time to work out the Stop Exercises before beginning work on the actual programming problems, far fewer mistakes occur. The answers to these exercises are also provided. In summary, C++ Object Oriented Programming is a very readable text that grounds one well in object oriented programming and its techniques. It is very application oriented and not a theoretical rewritten language reference manual. Now, read the first OOP chapter 4 and see for yourself! It was in use at Illinois Central College in the Cmpsc 232 Object Oriented Programming course. This edition has been updated to use Microsoft’s Visual Studio .NET 2005 compiler and 2008. C++ Object Oriented Programming comes in Adobe pdf files. One file contains the entire book. There are also individual chapter pdf files. All of the sample programs are provided as well as the test data needed for some of the programming assignments are provided. If you do not have the Adobe Reader, Get Adobe Reader by clicking this link.